Cuisine Kathleen: It's about time!!! 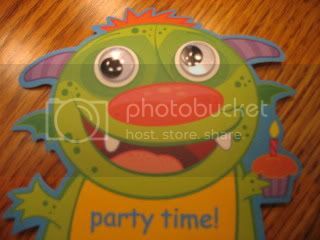 Happy Bday and Outdoor Wed.
Where did the time go?? It was a busy holiday weekend here.. I had my extended family on Friday for a celebration, pulled pork, Long Island Clam Chowder, Sausage bread, shrimp, steak, brats, burgers, dogs, salads and a slew of desserts... The weather was great the whole weekend.. Sat. we had a Beach Party in the community. Hey, did you know the Southern Daydreamer was originally a CT Yankee..a few more points for her! My porch steps decked out for the 4th..
And I would be remiss if I didn't wish Carol and Jayne Happy Birthday!!! 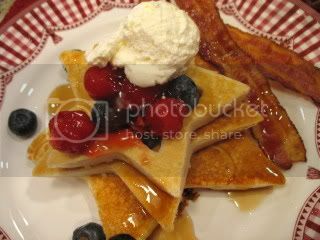 Please join me in a little treat I made for them..
Star pancakes, blueberries and cherries and a dollop of whipped cream!! Happy Birthday my dear friends! Many more!!! Don't forget Suzy's Ice Cream Social this weekend...it will be fun! Star pancake molds from WmSonoma outlet..and those cute invites from Christmas Tree Shops...oh, right, I still never showed you what was in the bags!!! Your place looks so beautiful all decked out for the holiday. I just love those little step pots - so inviting. I'm glad the gazebo cover has finally arrived..is chandy up too? Missed you..but I see you've been very busy. Everything looks beautiful and 'Ready For Summer'. I just hope the sun stays with us, for more than a few days at a time. Yummy pancakes and what fun to have special 'one on one' time with Lily. A 'cast' ?... Ouch! Hope that will be off her soon. Love the stars pancakes... How wonderful is it that the rain stopped in time for the holiday! Perfect timing. Glad you and Lily had some Nana and granddaughter time to bake. Sounds delightful. Thanks for stopping by my blog. I know the feeling about the deer. I can't do daylilies or hydrangeas in my yard. I think I need one of those wildlife cameras that I read about on another blog. Would be interesting to see what kind of pictures I'd get. Well, hello there, Kathleen! Looks like you have been a busy lady. I'm so sorry about your little grand's arm, and I hope she feels better very soon. Happy Birthday to the birthday girls and looks like you have a spread prepared for them! Love your steps (so cute) and your flag! Happy Outdoor Wednesday, and what is the Ice Cream Social? I'm posting for TT and FF this week. Maybe I should hook up because I'm doing ice cream??? You certainly shouldn't be able to say you are bored. Lots happening there. The pancakes are so cute and festive. You've been busy, Kathleen! Lots of cooking and funtimes. Thank you for the birthday wish and yummy pancakes! Everything looks so festive! I absolutely love those star pancakes, they are going on the agenda for next year!!! hey, Kathleen, thanks for the birthday wishes and the pancakes look great! Guess that pup is as close as you're getting to ever having a pet? LOL! The house and the yard looks great dressed up in it's 4th of July finest! Hope the kids are feeling all better! DIL probably needs a Calgon take me away bath or something! LOVE the pots on your steps! I really loved your step decor-- too dang cute. 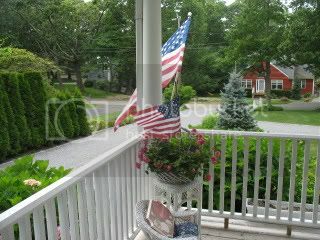 I love the way you decorated for the 4th, especially the steps, thank you for sharing. The view from your porch is so pretty. Thanks for sharing! Beautiful patriotic decorations - and how nice of your neighbors to put a pretty red house right in your line of sight to match! Your star shaped pancakes look yummy! Kathleen, glad you finally had a sunny weekend. 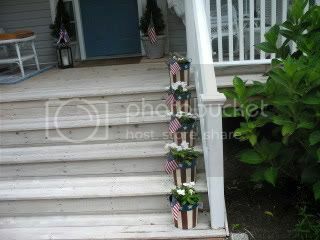 Love the patriotic pots on the steps! What a wonderful mom and grandma you are. Let's hope everyone is on the mend soon. Love your 4th decorations. Thanks for sharing. Kathleen - everything decked out for the 4th looked fantastic! All your little details makes everything so festive! The star pancakes even look good to me, I very rarely eat them! Hi Kathleen! Love your pretty porch and I wanna come over and have some of those marvelous looking pancakes! I've entered your name in my giveaway! Looks like a fun time was had by all and your home looks great. Love the star molds for the pancakes. Happy OW! 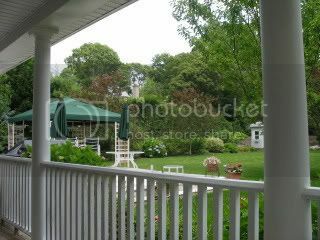 Delicious pancakes, looks like you had a lovely time, your porch and gazebo are beautiful,love the little welcome sign. happy OW, Kathy. Oh, to be near the bay... I love the name Lily. It was the name of a great-great (well, I don't know how many "greats") aunt I had growing up. She was quite a character. Had a dog named Lily once too. Everything looks wonderful. Wish I could cook like you. Thanks for stopping by earlier and leaving the nice comment. Good luck with those deer -- must be frustrating for you! I've been checking out your previous posts -- it's obvious that you're both an amazing cook and a talented food stylist. So beautiful! Your 4th/birthday celebration looks grand. I love the shape of those pancakes!Thank you for sharing. Happy OW. Wow, lovin' those pancakes and outdoor settings! Great shots! Your deck decor is lovely!! And the pancakes look delish, although my eye is on the bacon!! I love seeing my friends in the U.S. celebrating the 4th of July! I live in a French area of Canada, and it's not always a good idea to show Canada-pride unfortunately due to politics, but I'm on my way to English Canada soon, so I may steal your ideas and replace them with Canada flags next year!! 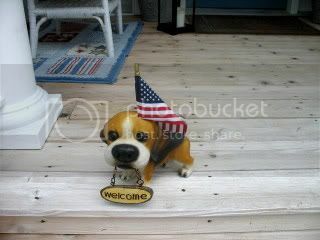 Your 4th of July decorations are so cute. I love the front porch steps!! And back to the food~LOL!! The pancakes look great!! I never think to buy molds because it sounds like extra work when the natives are hungry, but I bet it is really something special for a child (or dear friend). Finally you have that cover! Your gazebo, porch and yard look wonderful!